Did you know that volunteering a few hours a month could help change someone's life forever? Genesee County Habitat for Humanity is a volunteer-driven organization. We welcome people from all walks of life to join us as we build simple, decent, affordable houses in partnership with God and families in need. Though the vast majority of volunteers have no construction experience or building skills, volunteers are involved in most phases of construction. By working side-by-side with the family who will live in the house, our volunteers experience for themselves the joy created when a family is able to realize their dream of home ownership. ​Check out AgingInPlace.org's guide for senior volunteers! Habitat is a volunteer-driven organization. We cannot function without your donations of time and money. Every hour and every dollar that you invest in Habitat brings another member of your community one step closer to realizing their dream of homeownership. I'm not a carpenter, and I'm not good with tools. What can I do? Tell me about Habitat committees. What do they do? The Homeowner Selection Committee screens applications and interviews prospective homeowners. 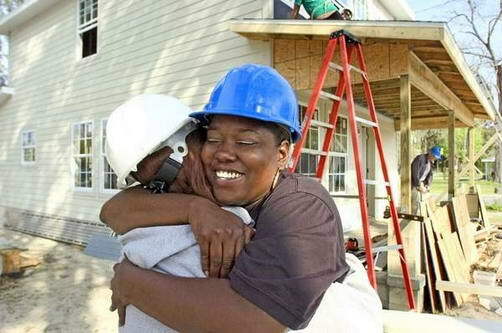 The Homeowner Support Committee mentors partner homeowners and encourages them to stay involved with Habitat. The Construction Committee oversees the construction process ensuring best practices and helps with materials procurement. The Resource Development Committee oversees fund-raising efforts.